Ha, last day free of work.. School started on tuesday. When I was in bed the night before I looked upon my wall.. It had so many different colours painted on that it was really, really a mess. So I decided to repaint the whole wall with some Sigma Superlatex I got from Paul but halfway through the process i couldn't resist to be creative. So I taped it all Enjoy this 'Aliens Just Recycle' piece. 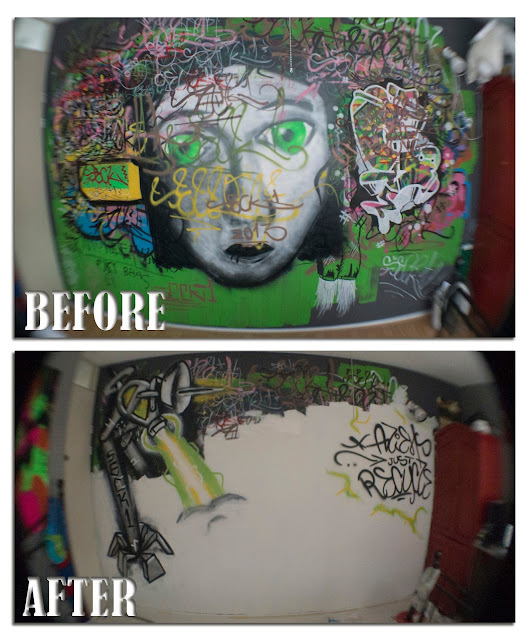 Its an Half Life 2 like character blazing the paint on my wall. Dope!